Greece with its capital Athens is located in Europe (Southern Europe, bordering the Aegean Sea). It covers some 131,958 square kilometers (slightly smaller than Alabama) with a population of 10,768,500. Modern Greek, English and French are some of the languages spoken by the majority in Greece (consider regional differences). Albania, Bulgaria, Macedonia and Turkey are bordering countries. To reach someone Greece dial +30 prior to a number. The local cellular networks are operated on 900 MHz, 1800 MHz, 3G, 4G. Websites typically end with the top level domain ".gr". If you want to bring electric appliances (e.g. battery chaarger), keep in min the local 230 V - 50 Hz (plugs: C, F). The sign for the locally used currency Euro is EUR. 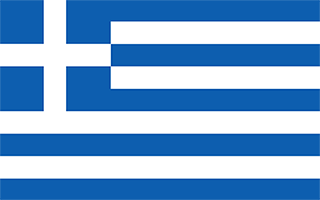 Nine equal horizontal stripes of blue alternating with white; a blue square bearing a white cross appears in the upper hoist-side corner; the cross symbolizes Greek Orthodoxy, the established religion of the country; there is no agreed upon meaning for the nine stripes or for the colors.